All the power of the S4 (minus the camera and screen) in a waterproof package. A little too much chunk, but good for peace of mind. What do you do when you create an incredibly lucrative brand? Milk it for everything it's worth, and it's that mentality that has led to the creation of the Samsung Galaxy S4 Active. The S4 Active arrived alongside the Samsung Galaxy S4 Zoom and Galaxy S4 Mini a short while after the flagship Samsung Galaxy S4 as the Korean firm looks to get the maximum from its internationally recognised brand. As you may be able to guess from the name the Galaxy S4 Active is aimed at the rugged market with its key selling points being its dust and water resistant. It's IP67 certified which means it'll survive being dipped into fresh water for up to 30 minutes at a depth of 1 metre. 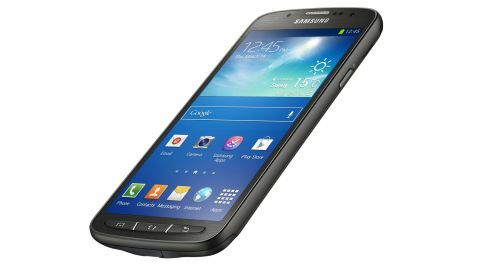 Unlike its brothers the S4 Mini and S4 Zoom, the Galaxy S4 Active hasn't seen its specs slashed viscously by Samsung and thus it makes it a much closer relation to the stock Galaxy S4. Some changes have been made however, with the camera on the S4 Active only 8MP compared to 13MP on the S4, and the 5-inch screen is a TFT affair instead of Super AMOLED, but it still boasts a full HD resolution and looks smashing. On the inside you still get the powerful 1.9GHz quad-core processor which adorns the flagship, plus the same 2GB of RAM and Android 4.2 OS which zips along nicely. When it comes to price then there's little surprise that the S4 Active will set you back £490 (around $765, AU$830) SIM free, while on contract you can pick it up for free from £29 per month over two years. The price, coupled with its decent line up of specs means the Samsung Galaxy S4 Active goes up against the likes of the also water resistant Sony Xperia Z as well as the other stalwarts at the top of the smartphone game such as the HTC One, Nokia Lumia 925, BlackBerry Z10 and even its brother the Galaxy S4. As part of the effort to make the Galaxy S4 Active waterproof the handset is slightly chunkier than the S4, measuring 9.1mm in depth compared to the 7.9mm chassis of the original. It's also wider, taller and heavier with vital statistics of 139.7 x 71.3mm and 153g making the S4 Active a more substantial device in the hand, although it's still just about manageable - unless you have small hands that is. Looking at the S4 Active from the front or side reveals it shares the same design as the Galaxy S4, with a polycarbonate body wrapped with a metal rim round its circumference providing a rigid and relatively premium look and feel. The big difference on the front are the buttons below the screen, with the touch keys present on the rest of the S4 range replaced with chunky physical alternatives. These add to the rugged nature of the S4 Active and are present due to the fact the touch options are less responsive in wet conditions. The keys themselves do require a decent amount of pressure to register, so if you're used to just lightly tapping a touch button then this will take a little getting used to. Take a look at the edges and on the right you'll find the power/lock key while on the left there's the volume rocker switch. Both buttons have been given a textured finish making them easier to find and providing more grip if you're handling the S4 Active is slippery conditions. Placement of both is good and you're able to hit them one handed without too much issue, which is great for such a large device. Up top there's a headphone jack, but unlike the Sony Xperia Z there's no tricky cover to fiddle with here. Samsung has made the port water resistant without the need of a flap, so if you invest in some waterproof headphones you can take the Galaxy S4 Active swimming and still listen to your tunes. Something which hasn't been given the water resistant treatment is the microUSB port on the base of the device which does sport a plastic cover which you'll need to pick off every time you come to charge the S4 Active, which gets a little annoying after a while. We also fear for the structural integrity of said flap, as it feels like something which could easily break after a number of uses and thus ruining the Galaxy S4 Active's water resistant credentials. Flip the Galaxy S4 Active over and you'll find things are a little different here compared to the rest of the S4 range, with a more industrial design adding to the rugged tag the handset sports. Four large, metal rivets adorn each corner of the handset although their function appears to be purely cosmetic, but nether the less they look good and the rubber strips which run between them at the top of the bottom of the S4 Active provides some additional grip. We'd have liked to see the rubber also make its way onto the removable back plate which takes up the majority of the rear of the phone and its slick plastic finish does little in terms of grip. Now you didn't just read that wrong, we did indeed say the back of the Samsung Galaxy S4 Active was removable while still being a water resistant device - something the Xperia Z and even the Panasonic Eluga can't boast. Peeling it off reveals a microSIM port as well as the welcome presence of a microSD slot and even a removable battery, which will no doubt please many of you power users out there. Once again we're a little wary of the water resistant credentials of the S4 Active with all that exposed tech hidden away under the exceedingly thin back plate which has a tiny seal running all the way around it. The Galaxy S4 Active does come with warning stickers on the back notifying you that you need to ensure the back plate is fully engaged - especially below the camera lens - before you even think about taking it for a dip. There have been reports of water leaking into the device, so if you're planning on taking the S4 Active into the bath with you make sure everything is properly sealed before sliding in. We didn't experience any leaks when we took our Galaxy S4 Active for a splash in the bath and shower, and it managed to stay water tight when we were caught in heavy downpours too. The Galaxy S4 Active does live up to its rugged nature as we did drop it several times - thanks to a recently broken finger - and it survived every hit with no visible damage. Overall the Samsung Galaxy S4 Active is the macho version of the firm's flagship smartphone. The camera and screen may not be quite as stellar, but if you can get over that and the slightly larger dimensions it's certainly an attractive proposition. Sure it doesn't have the same sultry design of the HTC One, but remember you're getting a water resistant mobile with the added benefit of a microSD slot, removable battery and just one annoying flap which trumps the Xperia Z. Its solid build and additional heft makes the S4 Active feel like it could take a number of bumps and go on trips we'd think twice about taking our HTC One or iPhone 5 on, but at the end of the day there's no escaping the plastic finish.